I have several more wonderful heirloom flowers blooming here in Oregon in late February. 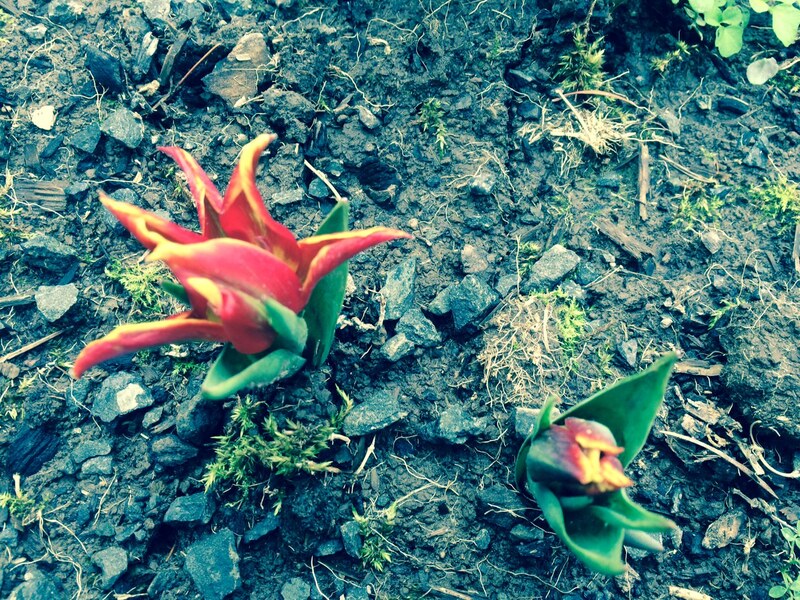 Tulipa schrenkii is shown in the first photograph. It was introduced into Europe in 1608 from Turkey and is rare today. The rather pointed petals are a warm red, margined with golden orange. John Parkinson described and illustrated this tulip (though botanists have changed its name) in his great work A Garden of Pleasant Flowers, published in 1629. He calls it “Tulipa pracox rubra oris luteia. The early red tulipa with yellow edges, or the Duke.” This species was an ancestor to the ‘Duc van Tol’ tulips, which were developed to be forced into bloom and sold, during the seventeenth and eighteenth centuries. Tulipa schrenkii is hardy in USDA zones 3-9. Tulips are fairly easy to grow. they prefer sandy or light soil, full sun, and a dry summer. If you live in an area with rainfall in summer, you can dig them and store them in in netted bags or open boxes until October, then plant them again. The bulbs will increase under such treatment. I cover my bulbs with poultry netting to discourage cats from scratching the bed and squirrels from digging the bulbs. The beautiful. fragrant Narcissus orientalis known in the nursery trade as ‘Grand Soleil d’Or’ is illustrated I’m the second picture above. This plant is illustrated in Parkinson as well, labeled ‘Narcissus Africanus aureus major.’ He compares it in size to the beautiful ‘Primrose Peerless’, and mentions that it is of “…exceeding sweet a sent” (I have used the modern “s” instead of the antique “f” used in 1629). Parkinson also mentions the “blackish brown coate or skinne” covering the bulbs. 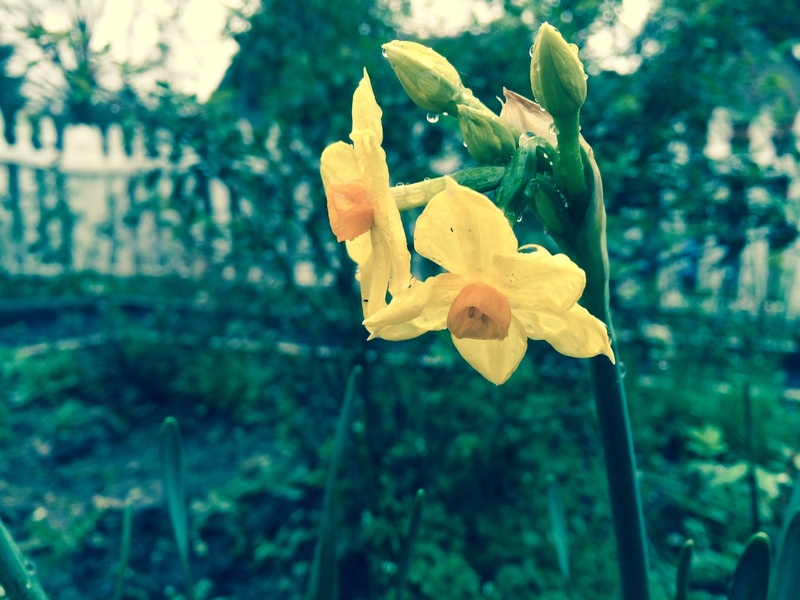 This narcissus is forced in great quantities today and has a delicious scent. Out of doors, it is hardy in USDA zones 8-10 and needs a dry summer as well, being native to northern Africa and Asia Minor. 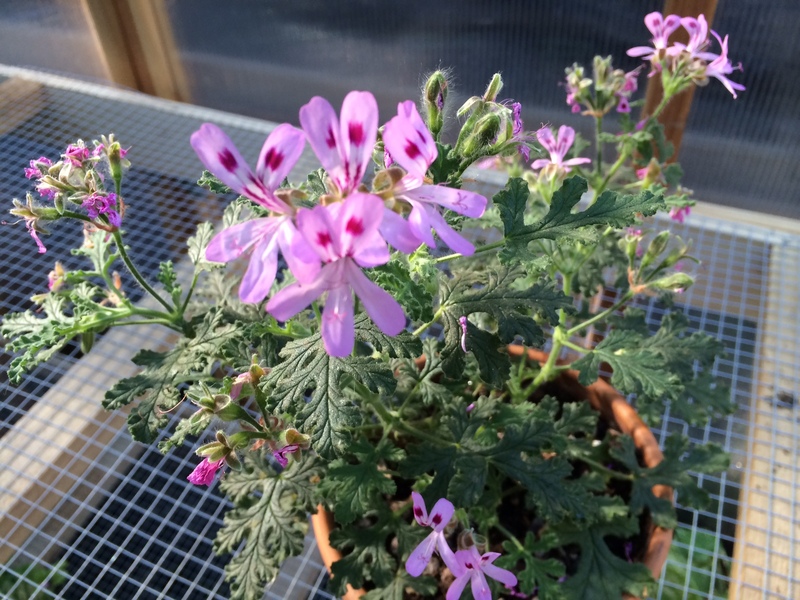 I have grown this variety inside the house; in the low desert in California, and now here in Oregon (in the warmest, sunniest spot available). It is beautiful and indispensable in my garden. 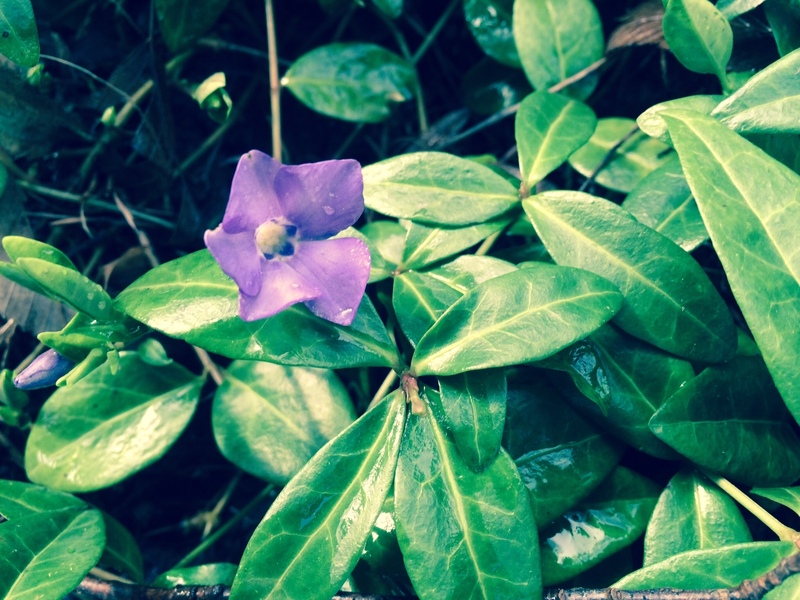 The third photograph depicts Vinca minor or periwinkle, just beginning to bloom here. It has been grown since Roman times and Pliny refers to it as Pervinca. Chaucer used the spelling “Pervinke”. The plant is a vining groundcover with evergreen leaves and lovely blue flowers. Periwinkle loves part shade and a moderate amount of water. A white form exists, as well as a double blue and a plum-colored single. Vinca minor is hardy in USDA zones 4-10. An important feature of these three plants is that they can be grown with moderate water, an important factor in the increasingly dry climate of the U.S. The three flowers above are the first to bloom in my garden this year. 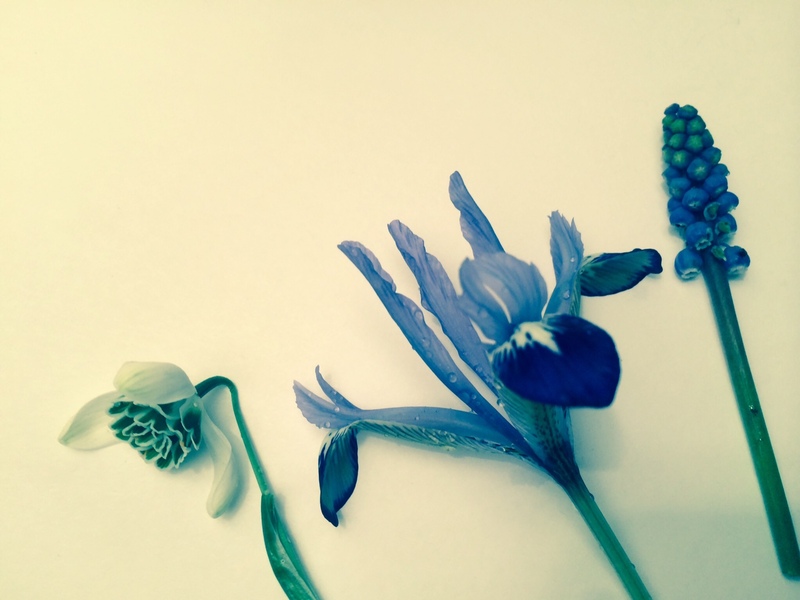 The first photo shows blooms (from left to right) of: Galanthus nivalis flore pleno, the double snowdrop; Iris reticulata; and Muscari botryoides, the grape hyacinth. The snowdrop and the iris were planted last fall (2015) and the grape hyacinths were here in the garden from times past. The double snowdrop is a beautiful flower, having rows of green and white petals that resemble the old-fashioned layered petticoats worn in the nineteenth century and before. The single form was known in ancient times and is described by Theophrastus. It is illustrated in Gerard’s The Herball of 1596 and was considered a type “bulbous violet” at that time. The double form, illustrated above, occurred in the eighteenth century. It blooms slightly later than the single form, but is quite unusual and uncommon today. G. nivalis is native to Europe and likes cool, rather moist conditions and cold winters (USDA zones 3-8). I have mine planted in part shade under a Pieris tree. 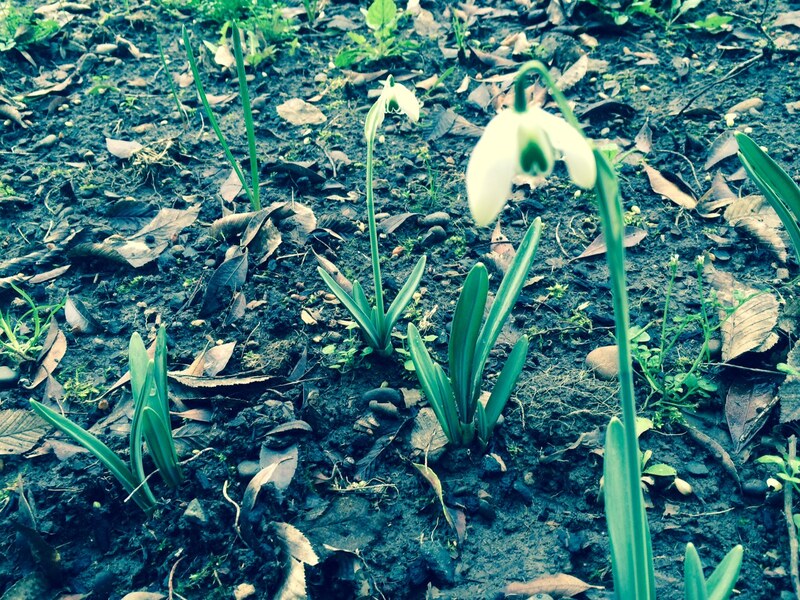 Snowdrops have a faint, earthy fragrance and will begin to bloom as soon as the snow melts. Iris reticulata, which does not seem to have a common or folk name, is native to Turkey, Iran and the Caucuses Mountains. Bulbs reached Europe and North America in the mid-nineteenth century; nowadays several forms and colors are available. The flowers have an unusual violet-like fragrance. The plant is beautiful and undemanding, preferring full sun, rather alkaline, gritty soil and dry conditions in summer. I. reticulata thrives in USDA zones 4-9 and multiplies well. Muscari botryoides is the original “grape hyacinth” known since at least 1596 and is illustrated in Gerard’s Herball. 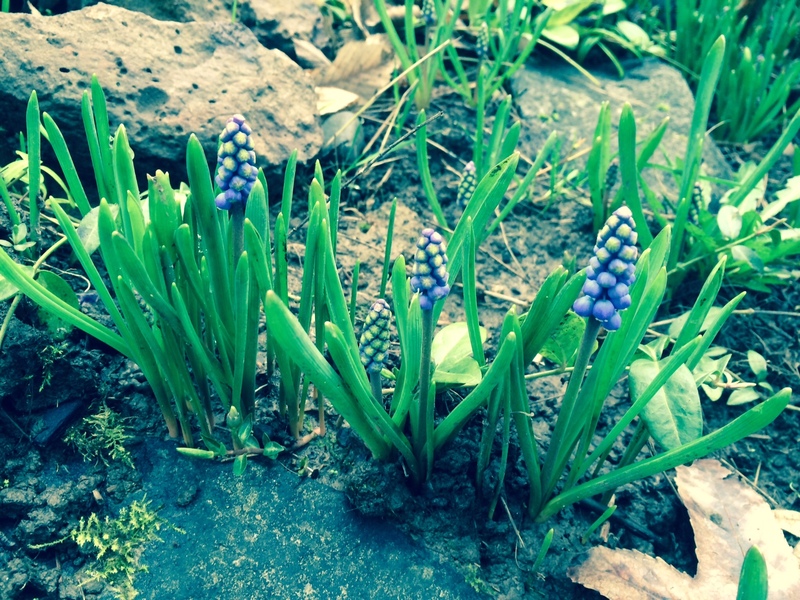 It resembles the commonly grown Muscari armeniacum, but blooms earlier. It is hardier as well, growing in USDA zones 2-8. M. botryoides has sterile upper flowers which are lighter in color than those below. The flowers have a fragrance of honey. M. botryoides has almost disappeared from modern bulb catalogs, but if you search, you may fnd it growing in old established gardens, or around abandoned home sites. 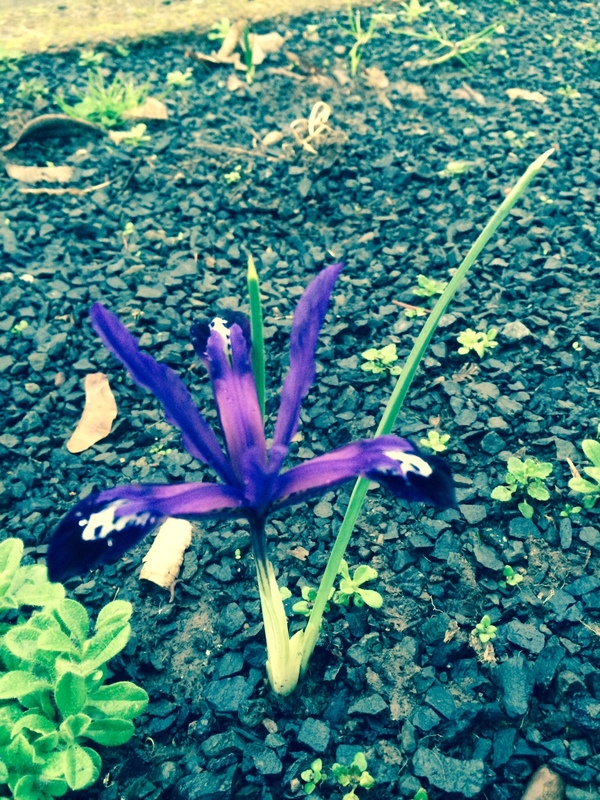 I am lucky that it was planted in the garden of my house, built in the 1920s. The flowers are just opening here in mid-February. Scented plants were extremely popular in the sixteenth through nineteenth centuries. People grew them in their gardens and on windowsills. Today, bright colorful flowers hold the public’s interest and we do not often see plants grown primarily for their fragrance. 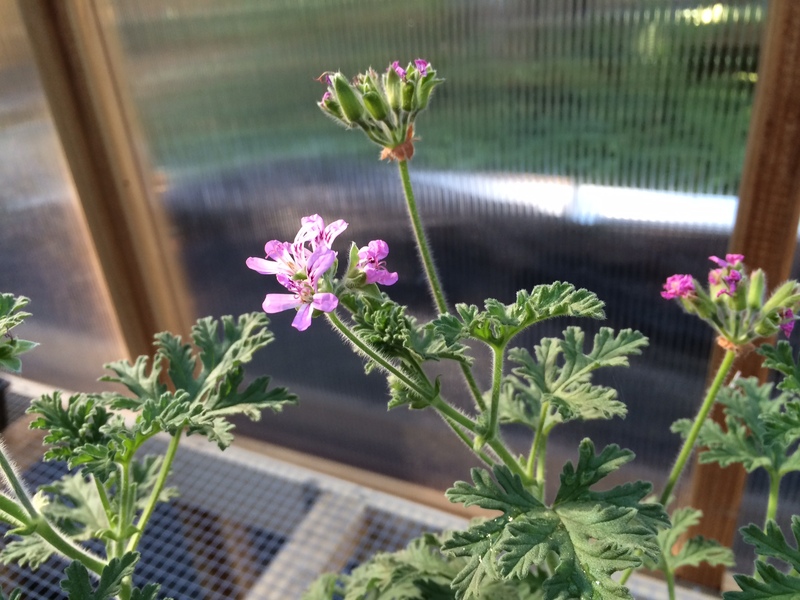 Scented geraniums (botanically classified as Pelargoniums), while not as showy as their modern hybrid cousins, the zonal (P. x hortorum) and Martha Washington (P. x domesticum) geraniums, are delightful and charming. The scented varietes are attractive, easy to grow plants that release their fragrance when touched. Scented geraniums are native to coastal South Africa. The first plants to arrive in Europe were brought by Dutch traders in the sixteenth century. Several species exist in the wild and hybridization has taken place over the long time since they were brought into cultivation. The second picture from the top, above, is of P. graveolens, known as ‘True Rose’. It dates to 1787 and is one of the oldest still grown today. It has a healthy, robust habit and delightful rose scent. ‘Grey Lady Plymouth’ is illustrated in the third photo from the top. It dates from 1802 and is a P. graveolens hybrid with a rose, fruit and spice scent. Its leaves are beautifully cut and margined with a thin white line. The very rare ‘Skeleton Rose’, also known as ‘Dr. Livingston’ is another old P. graveolens hybrid from the nineteenth century or earlier, with beautiful, deeply cut lemon and rose-scented foliage. This variety seems to prefer soil with a lower pH (more acidic) than the others. The top photo shows foliage and flowers of ‘Fair Ellen’ an old hybrid of P. quercifolium and has, as you would expect from the Latin name, oak-shaped leaves, scented of rich fruit and spice. The bottom photo shows potted scented geraniums wintering on a cool porch. The plant on the right is ‘Skeleton Rose’. On the left is the rather large velvet-leaved P. tomentosum known as ‘Peppermint’. It has a true mint scent. This variety is the most sensitive to heat and is the first to curl its leaves and wilt if it is in too hot a location. 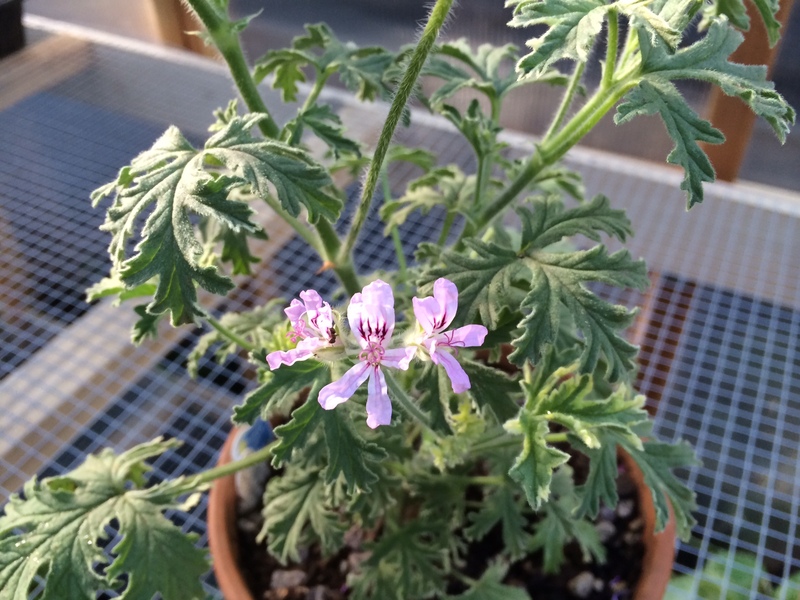 Many more species and old hybrid scented geraniums exist, but they are hard to find. I am collecting them as I come across them (and when I have the cash to buy them). Many scents and hybrids were once available, including: apricot-scented, nutmeg-scented, filbert-scented, spice-scented, lemon-scented, apple-scented, almond-scented and orange-scented. Louse Beebe Wilder, in her wonderful book ‘The Fragrant Path’, reprinted as ‘The Fragrant Garden’, mentions a person she knew as a child who owned a collection of over 100 varieties of scented geraniums. In her book, she lists 18 species and hybrids still available years later— in 1932. She complained that many had disappeared or were very hard to find. This seems true today, though plants are available from two sources that I can recommend: Logee’s Greenhouses http://www.logees.com and Select Seeds http://www.selectseeds.com. Both of these sources are in the eastern U.S. 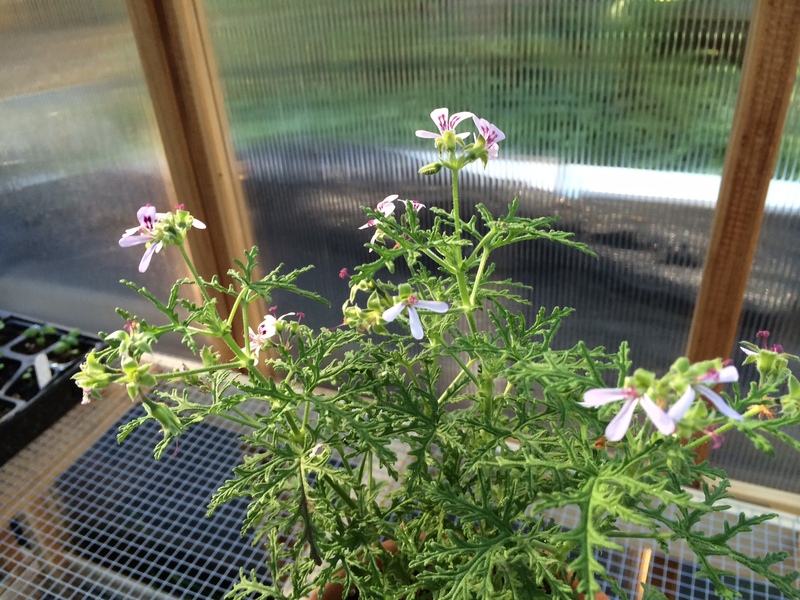 Seed for scented species can sometimes be sourced; this season I have started seeds of P. grassularioides, the coconut-scented geranium. Seed came from Terroir Seeds htpp://www.UnderwoodGardens.com. Scented geraniums are not difficult to grow. They prefer a somewhat cool, sunny atmosphere and a medium level of humidity. A sunny south facing window on a cool porch is very much to their liking in winter. That season is a rest period for the plants. Do not water them very much in winter, but let them almost wilt; then water. I make an organic soil mix with compost, bone meal, greensand, wood ashes and sharp sand or perlite (1/4 to 1/3 part of the potting mix, for excellent drainage). My plants really like this mix and I never need to fertilize. In early spring growth begins and picks up speed into summer, so watering is increased. It is best to let the plants become nearly dry— avoid overwatering. During the heat and bright sun in summer, some of the plants may begin to flag, so it is best to put them in an east window or provide light shade and a cooler location. 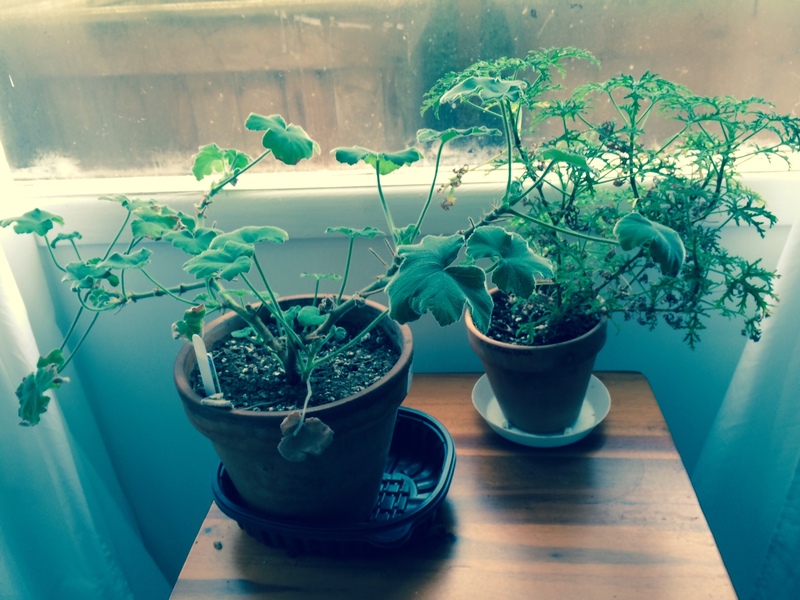 I repot my scented geraniums once a year, unless growth warrants additional repotting. Otherwise, it is best to do so in summer. Softwood cuttings can be made anytime from April through July. If a plant is repotted in early autumn, cuttings may be taken then also. My photograph above shows young heirloom perennial and biennial plants in flats and seed containers. Now is a good time to finish repotting them so they will grow large enough to set outside when weather permits. If your climate is mild enough, February is a good time to begin planting deciduous trees, roses, raspberries, gooseberries and currants. Roses, fruit trees, raspberries, gooseberries grapes and currants may be pruned as well, if your climate is not too cold. In very cold climates it is advantageous to wait until very cold weather is over and you are sure of the extent of winterkill on branches. If fruit trees and roses are pruned too soon, they will begin to grow earlier and my be harmed by late spring frosts. This is especially true of tender roses, apricots, almonds, peaches, prunes and grapes. In Montana, living in USDA climate zone four, I usually waited until March to prune hardy fruit trees, and April to prune tender fruit trees and roses. That way, one can cut off the winterkilled portion, cutting into live wood about an inch and a half. Make sure your pruning tools are clean; a 10% bleach solution in water will sterilize the tools. Clean tools after pruning each tree or shrub and after any cut into diseased tissue. After pruning is finished, rinse tools with clean water, dry them and wipe them with light oil to prevent rust. If pruning roses, do not use the pruning sealants designed for fruit trees, as they will cause die-back of canes on your roses. An excellent sealant for pruning cuts on roses is a water-based glue that dries hard, such as Elmer’s. Sealing rose pruning cuts will prevent cane-drilling wasps from destroying viable canes and prevents canes from drying out. Seeds of hawthorns and large species or shrub roses may be sown outside now to make thorny hedges. Seeds of fruit, shrub and rose rootstocks can be sown now also. Make sure to continue to check any plants in frames and to ventilate them whenever weather permits. If your climate is mild enough, you can begin dividing most perennials and replanting them. Wait until July to divide German irises (Iris germanica cultivars). Wait until August/September to divide peonies. Many hardy annuals can be sown outside now if weather permits: larkspur, lavatera, lychnis, nigella, poppies sweet peas and kiss-me-by-the-garden-gate. These all need cool temperatures to germinate well. 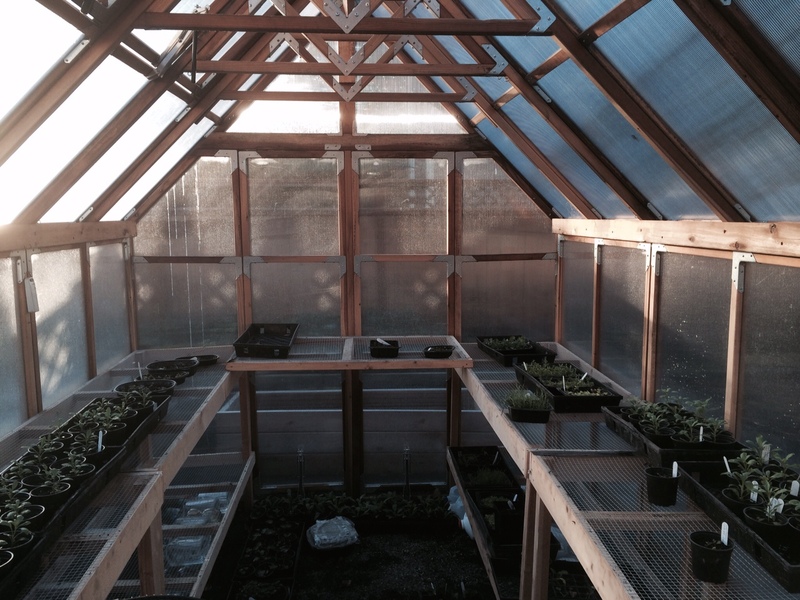 In the greenhouse you can force bulbs, strawberries, ranunculuses, pansies, violets, wallflowers, stocks, sweet williams, carnations, roses, etc. Under lights or in a warm greenhouse several tender annuals may be sown now, such as petunias, impatiens, geraniums, snapdragons, etc. Seeds of several cool hardy vegetables can be started in the greenhouse also, such as cabbage, cauliflower, kales, and onions. February is a good time to spread manure, alfalfa meal, bone meal, wood ashes, and other soil amendments over vegetable beds, asparagus beds, rhubarb, grapes and vegetables still in the garden. Do not place manure too close to grape or rose stems. Be sure to check mushroom beds and protect them from too much moisture. Dry straw is a good cover, and it helps to have a shed roof over mushrooms to protect them from too much rain. In February you can finish your orders for seeds, perennials, roses, fruit, evergreen and deciduous trees. Enjoy February!